I live in the desert and I have lots of succulents in and out of the house. I purchase the succulents when they are very small in the tiny containers. Like 2″ pots. The price for succulents this size isn’t so high, and I know they will grow. I purchased this soil knowing I was going to transplant some of my plants. 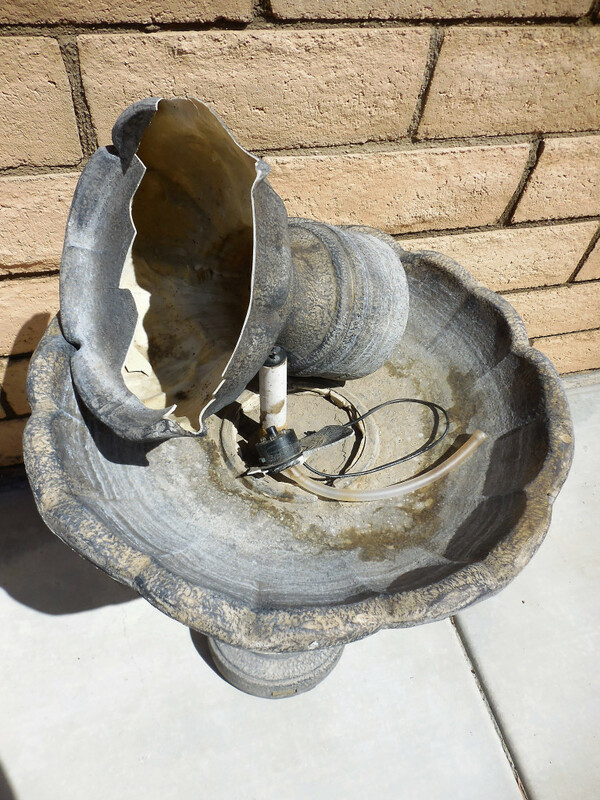 After I cleaned up the fountain, I put some small rocks into the bottom of the fountain for drainage. I mixed up the soil with some water in my wheelbarrow. I then added the succulents. Then I added some color and sparkle with the gems. I think it came out nice…As they grow too big for the fountain…I will move to a bigger space. I didn’t cut the pipe in the center that was on the fountain originally. It’s kind of off centered in the bowl….I was thinking of putting my butterfly dish on top, but it broke while I was trying to affix it on the pipe…ugh! I love where I put it. There is a Iceberg rose in back of the fountain. It just had dozens of fragrant blooms…yummy! Awesome job. I would say that 95% of the projects I do have at least some element of “scrap” or “junk” that I got curbside or was given to me by someone putting in a last ditch effort to avoid hauling their item to the junkyard. In my opinion it makes the outcome of a project more enjoyable and the process more creative. I always enjoy discovering that I am not the only one on this planet unafraid of other people’s trash piles as well. Thanks for sharing the project! It sure beats filling the landfills with stuff others can recreate. Thank you Jake your awesome! Now I have to get busy. Love that idea. Oh..I want to see what you do! I really like this one. Now to find a fountain! Do you have a annual free pickup, spring cleanup offered from your Waste Dept (Trash,Garbage) ? This is when I find stuff on the curbs. Everyone gets rid of their junk. But if it can be painted, tweaked into something else, or sometimes needs a good cleaning. I found so many items I upcycled. Look under ‘Garden’ and ‘Trash to Treasure’ in the menu. No. I live in a mobile home park and our annual junk days consist of those huge dumpsters. Can’t climb in or I might not get out! When it’s trash spring pickup in the communities surrounding your mobile home park! Get in your car and cruise! I have something like this in the corner of the garden that we don’t use anymore. The wide pot could still be used. Gives me an idea. oh, I’m so glad I got your creative juices going!!! I want to see what you do arlene….please!